I originally came from California, where I was born in 1930, to live at Sunbourn on Newton Road in 1933, when I was nearly three, after my parents separated. My mother (Dr Ethel John Lindgren) knew the owner, Miss Signe Laven (See under People section), a physio who had treated her, as well as Mary Greene of Harston House, and Miss Laven invited her with her son to share the house at Sunbourn. On arrival I stayed at Orchard Cottage while work on Sunbourn was being completed. (Orchard Cottage was and still is about opposite the bus stop on the triangular Green outside Harston House). Miss Laven became my godmother, and looked after me when my mother was away on her research work. Papworth, of a style which was quite popular, and I have seen replicas in several photos of those days. I assume it was summer time, but I do remember having afternoon naps and maybe even night-sleeping in the hut – for how long I can’t remember, but I don’t recall it being a hardship event – so it was probably a warm weather exercise. That hut is now called “The Summer House”, and it is on the side of our main lawn, half way along! I went to schools in Cambridge, lastly at St Faiths, 1937-39. In June ’39 I went to America on holiday to see relatives with my mother, but when war broke out I stayed there ( but my American mother returned to England and became naturalized British in April 1940). From 1944 to ’49 I boarded at a secondary school, Stowe, in Buckingham and after studying geography at Trinity College, Cambridge (1949-53), I went abroad and for the majority of my career worked in Africa for Esso / Exxon. I married Judy in 1957 and we had a daughter Jacqueline in 1959 and a son David in 1961. I retired and when my mother died in 1988, we soon thereafter came to Harston to live in Sunbourn. My mother was quite active in Harston. She and Maria Hurrell did a lot together at the time when Civil Defence was active (during the Cold War). My mother was also a member of the Horticultural society and attended and took part in many shows between 1965-81 where participants showed their vegetables/recipes, etc, to try and win any prizes that Henry failed to win. She was a parish councillor in the 1970s, and for many years a member of the Harston Parochial Church Council. With her second husband, Mikel Utsi, they sometimes brought reindeer to Sunbourn from their herd in Scotland, to which several Harston children made visits. Utsi’s son, Vincent, now lives at ‘Sarek’, in the plot behind Sunbourn. So when my wife and I came in 1989 to live at Sunbourn, we didn’t come as strangers. Village People — memories from youthful days. I remember of course the Greene family – to a schoolboy they seemed especially ancient. Sir W. Graham Greene was my godfather. He was nearly blind, and I would go down and read to him, probably only occasionally, from the Cambridge Evening news. He wanted read out to him the bits about Harston – in those days there were usually short bits summarising events in each village. I saw little of “Aunt Mary” Greene who painted a lot. But I remember Ernest, their gardener, a great character. One school vacation I worked for him at the Greenes, and he made sure I didn’t mess up his precious garden. It was a splendid place to play in when I used to go to Harston House a lot as a boy. Although I’ve been told later that Mary’s sister Helen had early on a career as a Swedish gymnast, I thought they were very apathetic!! I have some cine of them playing lawn cricket at Harston House — you would see what I mean! Going through my papers I noted that in 1942 in Orchard Cottage there was Miss Helen Greene and a Miss Hall (who I remember later had many, smelly, corgi dogs!). That is not necessarily the date Miss Hall moved in, just that she was there then. I knew the Hays and rode a horse, Fully, from their farm. I had riding lessons from Eileen Hays, Bill’s sister. I seem to remember falling off quite a few times! I remember the blacksmith Harry Lawrance who shoed my horse at the blacksmith’s forge in the High St. He was 71 in 1967. Lawrance’s granddad had started the business in 1861. 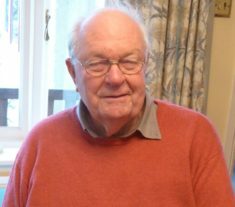 Cyril Northrop was a multi-skilled man from Newton who worked for Miss Laven. From railway sleepers, hopefully bought!, he built the Sunbourn coal shed. I also recall in the 50s that Ron Bass ran the petrol station (where BP is now). Later in the 60s Mr Chapman had a garage in Harston; his son Phil has moved to Foxton, where he still looks after our cars. I remember Ron Bass well – he ran our local garage, where the BP station is, and he looked after our cars. On my first home leave in 1955 I bought a car which he serviced – he ticked me off for having paid too much for it!. Before Dr Beeching closed Harston station, there was a manned level crossing. The station master lived in the house that is still there. 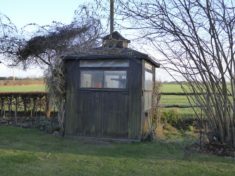 There was a signal box rather like the one at Foxton’s level crossing. The keeper (a short little man, name forgotten but very affable) would learn of a train’s approach, go down his steps to close the gates manually (one gate across the road each side, so heavy ones), go back up, do his signal work, have the train come through or stop, and after it had left he would open the gates. The gates were usually shut for five minutes at least. In those days there weren’t as many trains as there are now but if he saw a car coming along the road, he would wait for it before shutting the gates, unlike the barriers which drop now, insensitive to anyone’s urgency. Now, though, they are down for only 20 seconds before the train passes through! So that’s an improvement, except that we have no train stopping at Harston any more! In my time the line was run by L.N.E.R. In the 1940s, I made the odd trip to Cambridge or London but a regular trip was to go to boarding school by train. About a week before going I would take my school trunk down to the station, and consign it to the school, c/o Buckingham station. Then on the day of travel, I would walk down the hill to the station with just a small bag, and catch a train to Cambridge. After a while I would then catch a train to Hitchin, via Bedford. At Hitchin I would wait and then catch a train to Buckingham. Three journeys. All impossible now, I think, because of Dr Beeching’s efforts! At the end of term, the reverse journey was made. Harston was served basically by the red double-decker bus, No.108, which went from Royston to Drummer Street in Cambridge. They were pretty frequent, at least once an hour on weekdays. I would have taken the train to Cambridge more, but I remember the Premier Travel bus which went from Fowlmere, to Newton, over the hill here to Harston, and on request would kindly stop outside our house or the Old Windmill (then occupied by the Rogers family). It then carried on from the Harston Memorial down Church Street and on to Haslingfield and Barton and then to Drummer Street via the Catholic Church. In 1950-51 we had TWO village cricket teams. Now we don’t have even one! The station gate-opening man talked me into playing once, and I cycled from college to play against Barrington 2nd XI. I told them I was no good, but I was put in at No.4. I was soon out and the score was then about 0 for three wickets! I did take a wicket, but at some expense. I recall being careful in the field because there were cow pats! This was of course the field alongside the A10 (The Park), some 300 yards north of the shop. Because I was boarding at school or college I didn’t, sadly, take much part in village life, beyond attending church, when my mother was there to ‘encourage’ me to do so. I dated one girl from the village, but this is not the place for such recollections! My youth straddled the war, and life was very simple and things happened at a relatively relaxed pace. They were good years! This page was added on 29/10/2016.